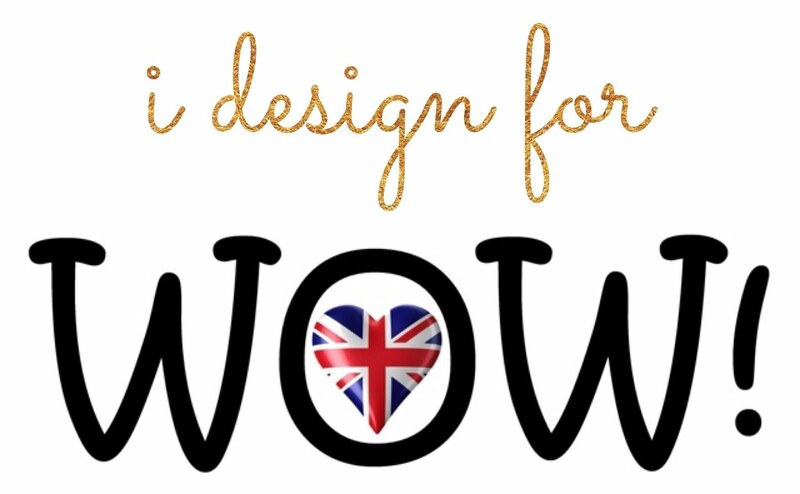 Lil' Inker Designs Super Coffee Die & Stamp Bundle + Giveaway! Today, I have a fun coffee card featuring Lil' Inker Designs Super Coffee Die & Stamp Bundle from their new release. 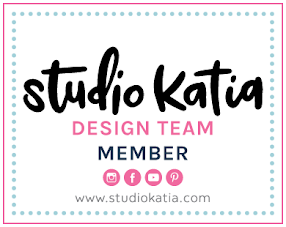 I really love their new coffee themed products and so excited to share this card with you as a part of Coffee Loving Cardmakers Blog Design Team. I started by ink blending the background with some Distress Oxide Inks onto watercolor paper. I used Wilted Violet, Peacock Feather and Lucky Clover. I then stenciled sun rays with Hero Arts Unicorn Pigment Ink and mini blending tool. For starry sky, I flicked clean water onto my background and picked it up with a paper towel. Then, I sprayed Altenew Ink Sprays Pure White and dried it off with a heat tool. 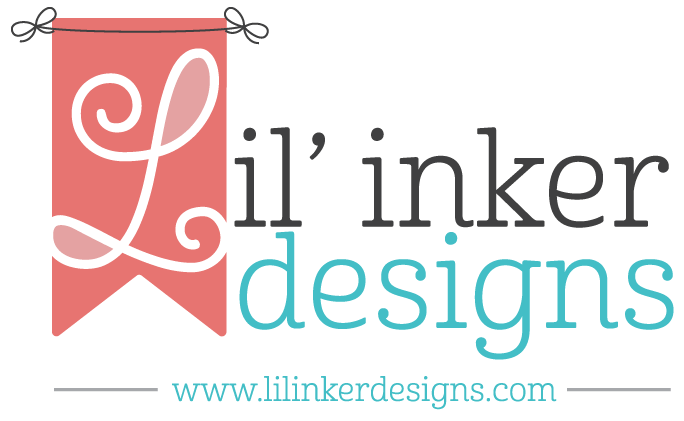 Next, I pulled out Lil' Inker Designs Super Coffee Stamp and stamped it onto white card stock. I then drew Superman mark on my cup, but I drew 'C' instead of 'S' because today's hero is Coffeeman. Lol. After drawing, I colored them in with Copic and Altenew markers. I die cut it with coordinating die set and foam mounted where I wanted it. To finish, I die cut city border from black card stock and adhered it down onto the bottom. I then stamped fun sentiment from Lil' Inker Designs Super Coffee Stamp Set with Versafine Onyx Black 3 times. I mounted whole panel onto A2 sized white card base and finished off this card. 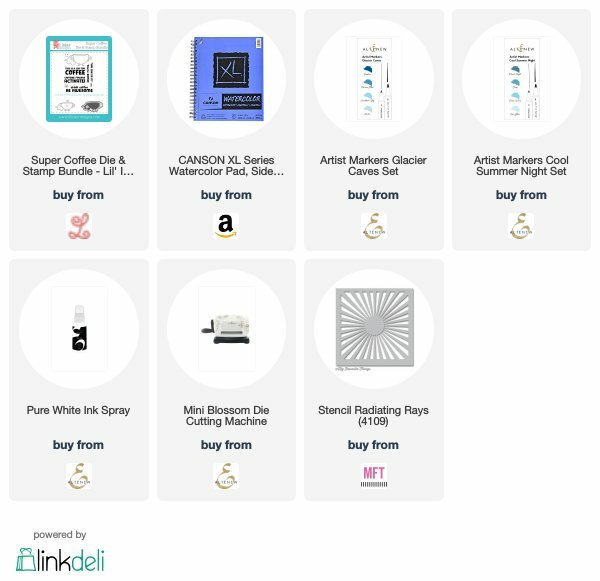 You can see more amazing cards from other CLC DT with Lil' Inker Sponsor Solo post. (click HERE) Thank you so much for stopping by! 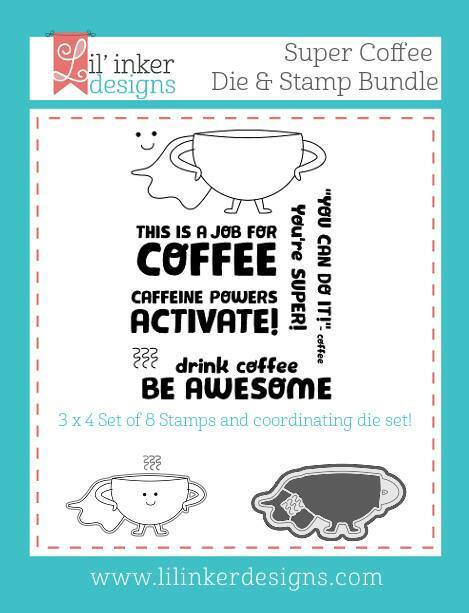 You have a chance to win one of two Super Coffee Die & Stamp bundles. Leave a comment on the Coffee Loving Cardmaker's blog and all participating blogs for a chance to win one of two Super Coffee Die & Stamp Bundles. 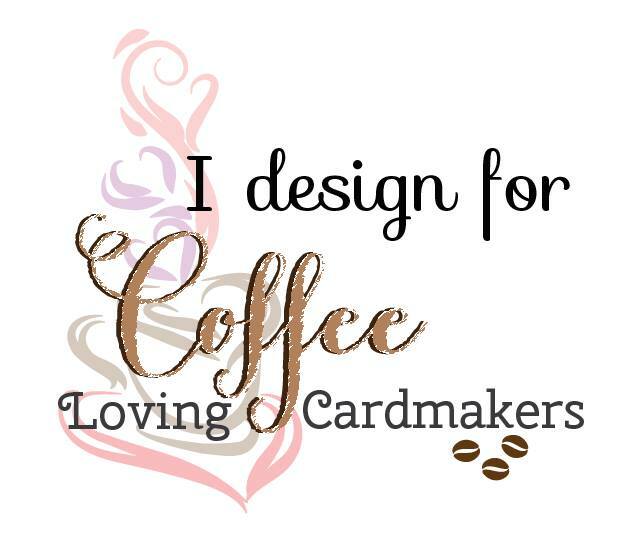 Commenting will close on June 22nd at 11:59 pm pacific and the winner will be announced on Saturday, June 23rd on the Coffee Loving Cardmakers Blog. 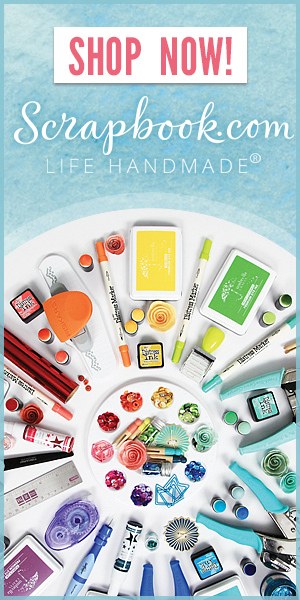 Your background is super for this fun stamp set! Awesome card! Love that background for the Super Coffee stamp! That super hero cup is ready to save the day! And, that is a gorgeous background for your city design too. Wonderful super hero coffee card! Your background is SO cool and super creative. Backgrounds are something I struggle with (usually just use patterned paper) but this is beyond inspiring. I love it! 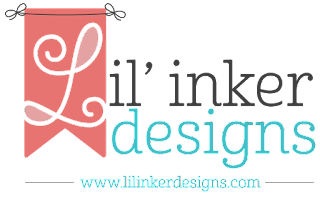 LOVING this Lil' Inkers stamp set and their fabulous new release. Your background is perfect for this super hero, Dana! Love how he's a combination of cute and powerful! I love your stenciled rays and the city skyline--perfect backdrop! Perfect background for this super coffee cup. What a cool stenciled background! I really like the blend of colors and this fun new coffee-themed set. GORGEOUS card! What a fantastic colored background! I really like how you made the super cup to resemble Superman! Very creative! Dana, this is super spectacular! Stunning! The real Coffee cup hero here, love the rays and background, so inspiring! I tooo like the background you made a lot. 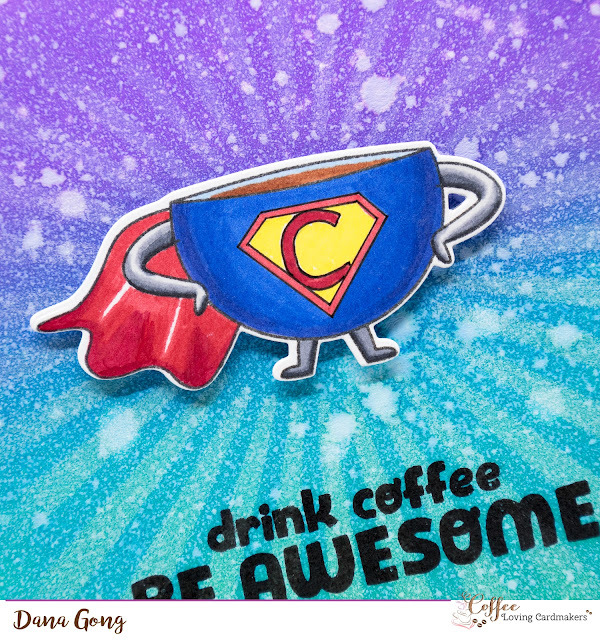 Such a super beautiful background with this Super Cup on your SUPER card! Your background is INCREDIBLE! I love this card! Oh My ! What a great superhero card you made !! The color combo is perfecf for this wonderful background !! This is so cute with the little C. I love the colors too...very nice card. 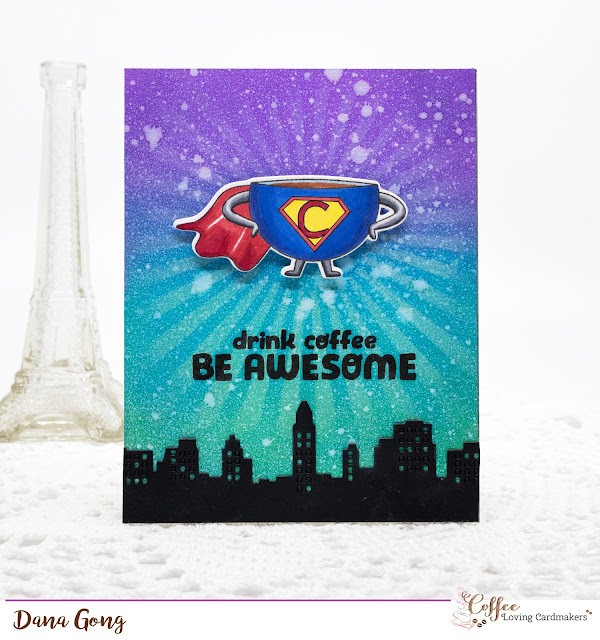 Such a cute and colorful card - love the super hero coffee cup flying over the cityscape. Oh my!!! What a stunning background! Love your adorable and funny card! This hero cup is so cute!!! Love all the special touches: the skyline and the "C" make this amazing! Fantastic card! 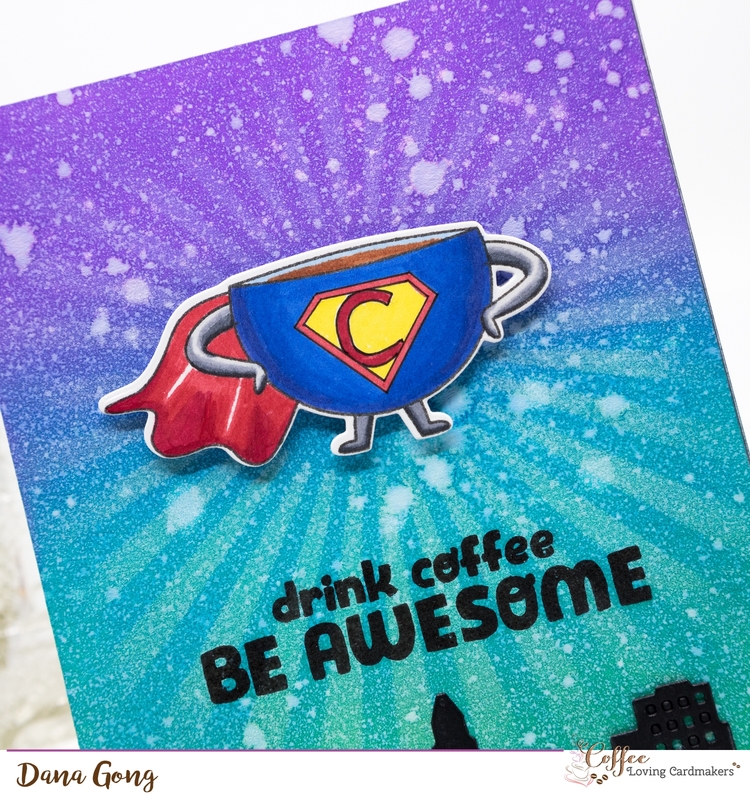 Love the background, especially the rays that highlight the adorable super hero coffee cup. Great take on the superman likeness.